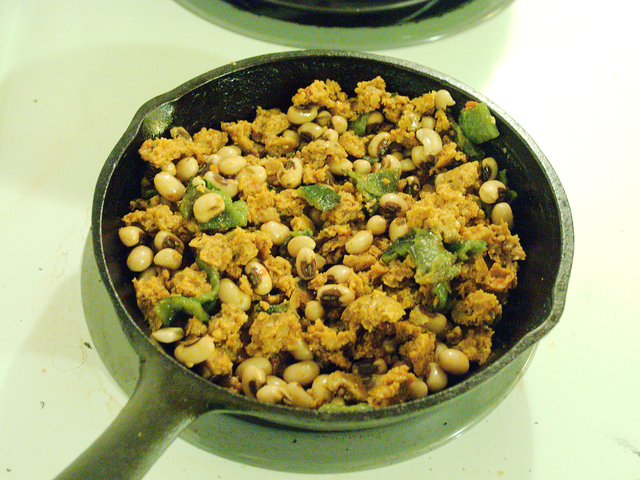 Here’s a tasty dish I whipped up last night partially to use up several different leftovers: a single link of soyrizo, a couple of poblano peppers that had seen better days, and a little less than a cup of cooked black-eyed peas. 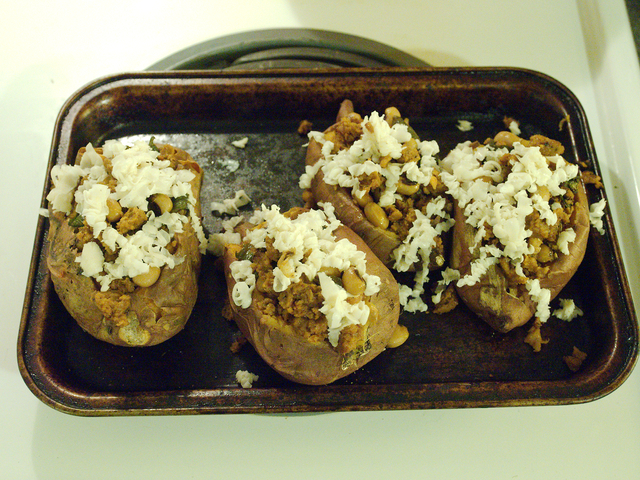 I also had a box of super-cute baby sweet potatoes from the farmers market that I wanted to base my meal around. I just combined all of that stuff et viola! 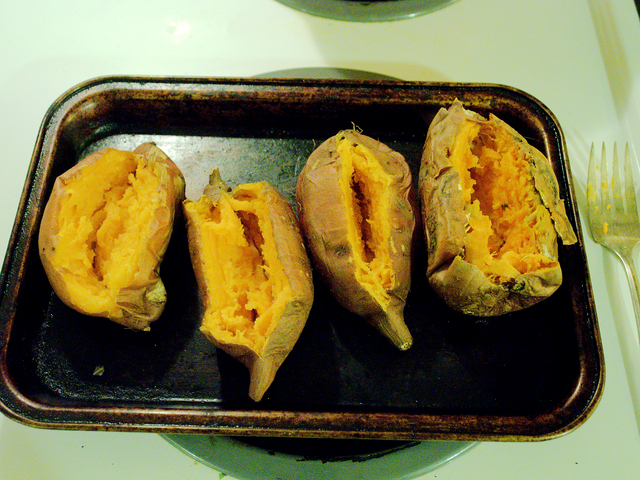 I used the largest 4 in a box of baby sweet potatoes, but you can also use regular sized ones. Poke them a few times with a fork, rub lightly with olive oil, and bake them (the toaster oven is perfect for this) at 400 degrees Fahrenheit until a fork pierces them easily. How long this will take will depend on the size of the potatoes; my baby potatoes were probably done in 30-40 minutes. Remove them from the oven, make a slit lengthwise down the top of them by poking with a fork, then put one palm on either end of each potato and press your hands together until the split opens up to a perfect pocket for stuffing. 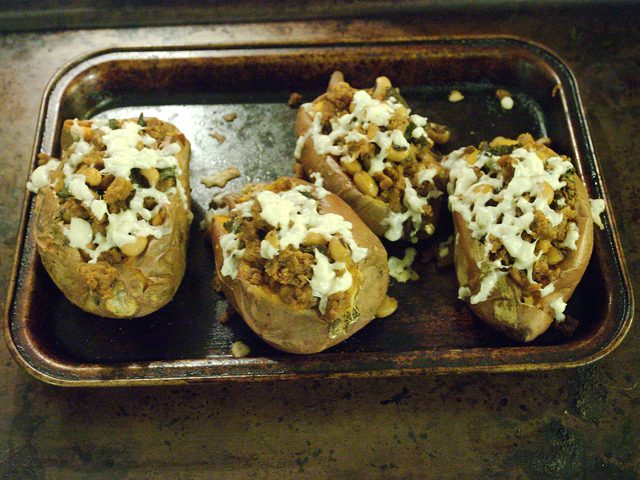 While the sweet potatoes are cooking, prepare the filling. Roast the poblano peppers. If you have a gas stove, you can do this right over the flame. I have an electric stove (bleh), but this pepper roaster works great on an electric stove. You could also put them under the broiler for several minutes, though if you do that, I’d stem and seed them first instead of after roasting so you don’t have to turn them. In any case, roast them until the skins are black and charred, then pop them into a paper bag, close it up, and set aside to cool. After 10 or 15 minutes, the charred skins will slide right off the peppers. Remove the seed and stems and chop the peppers. Heat some oil in a small skillet, then add the soyrizo, chopped roasted peppers, and cooked black-eyed peas and saute for a few minutes. 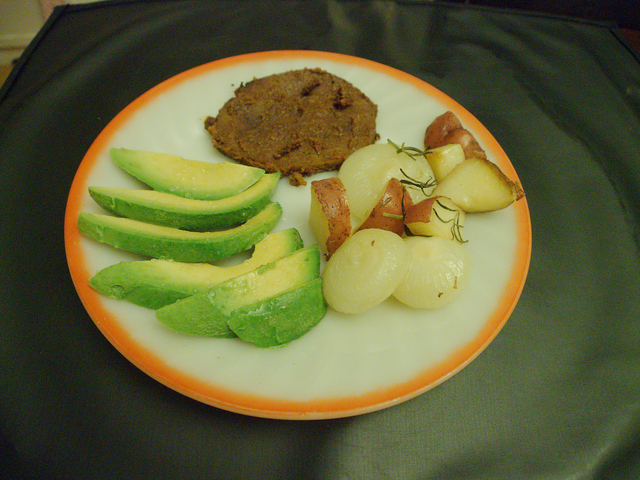 When this mixture seems thoroughly cooked, spoon it into each of the sweet potatoes. If you’d like, top with shredded vegan cheese. Pop back into the oven until the potatoes are warm and the cheese, if using, is melted. I served this with kale chips seasoned with cumin, chili powder, and smoked paprika, and a garden salad tossed with a homemade lime vinaigrette. (I believe the vinaigrette was olive oil, lime juice, garlic, salt, cumin, and cilantro.) 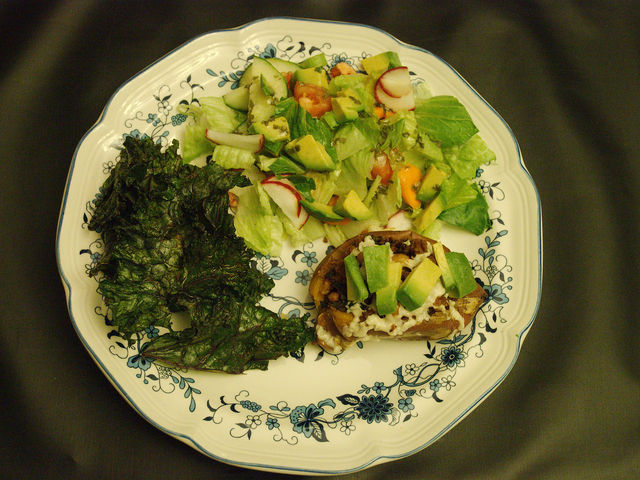 The leftover potatoes and kale chips made a nice lunch today. I haven’t posted any raccoon pictures lately! 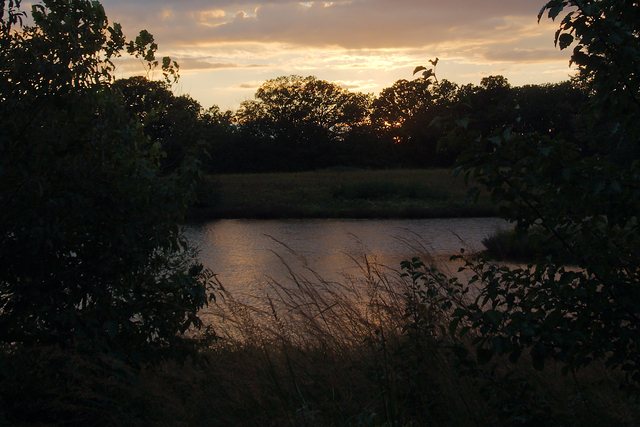 This was was taken from within a cage that I was cleaning. 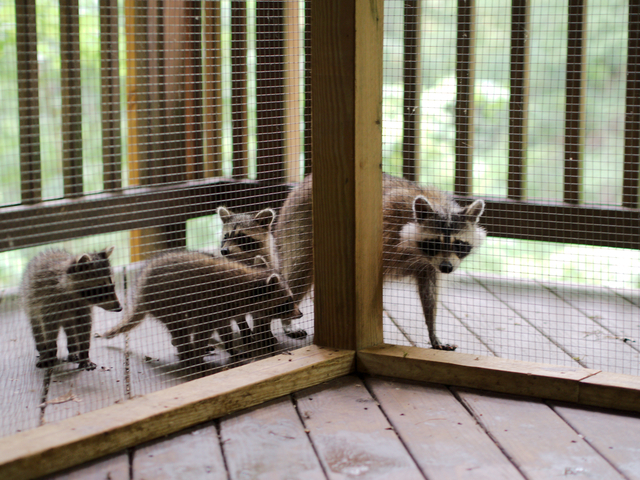 One of our wild mother raccoons was bringing her babies by for a visit. We released 19 raccoons a few weeks ago. 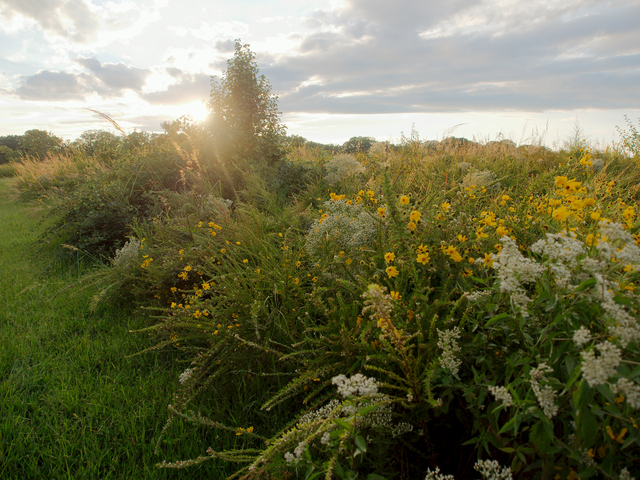 We’re lucky in that we can do what is called a soft release, which means we can release the animals right on the property, leaving their cages open and providing food for a few days until the more cautious are ready to totally make on their own and go find their own territory. 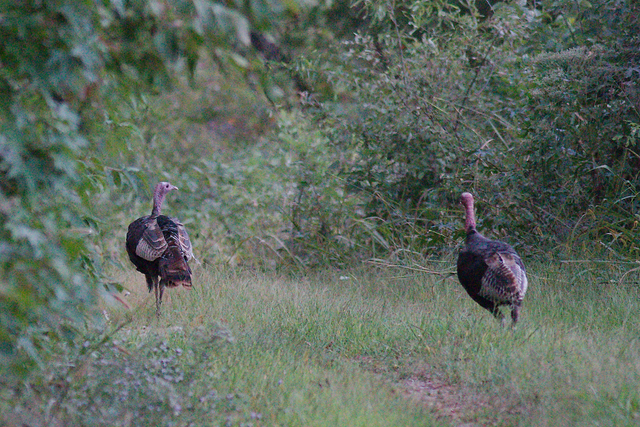 A few take off as soon as we open their little escape door and we never see them again, but many hang around for varying lengths of time. 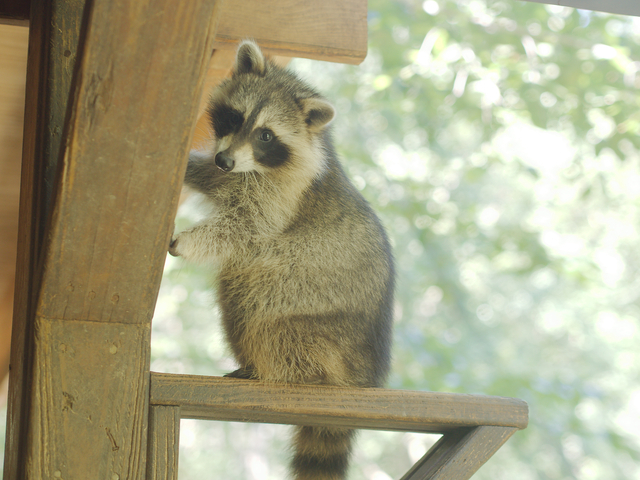 This is a raccoon that we released this summer who was lurking around the deck hoping for a food handout. Speaking of raccoons, if you have three minutes, this is an awesome video by the Humane Society that explains how we receive many of our orphaned babies – in fact it features Dogue Hollow! So if you want a tiny glimpse into where I spend a chunk of every weekend, watch through to the end. 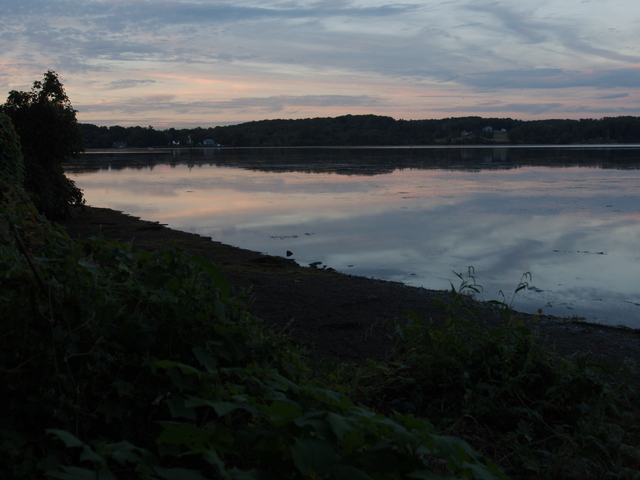 … but the sunset was pretty. 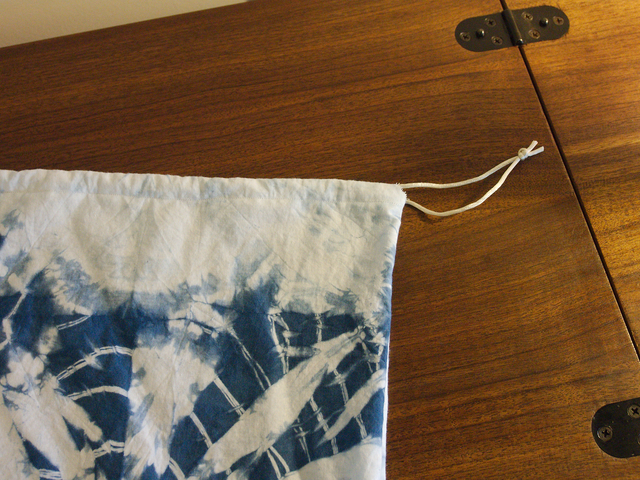 I feel somewhat bad that the first thing I’m posting after so long is a sewing tutorial instead of food, but this craft creates a bag for procuring food, and that’s a part of cooking, right? I’m becoming interested in natural dyes and to that end recently set up an indigo vat. 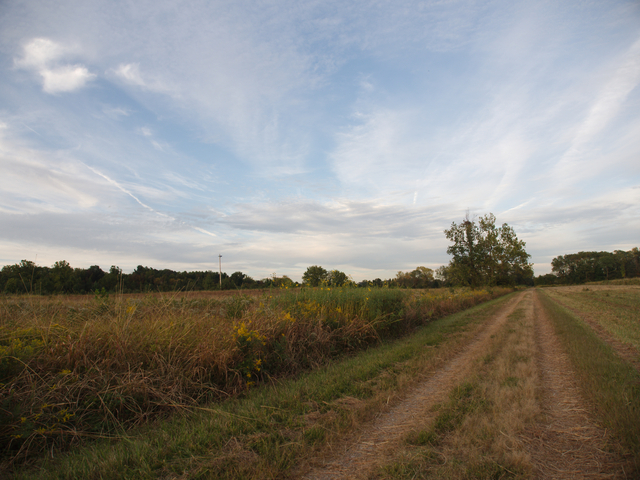 Indigo dye comes from a plant, but it’s interesting in that it’s actually fermented. And I’m a big fan of fermentation of all sorts. It traditionally takes a few days to create an indigo fermentation vat, but since I was just trying it out for the first time, I bought a kit that comes with pre-reduced indigo, which unlike non-reduced indigo, is water soluble, which eliminates all the time and hard work of the fermentation process. 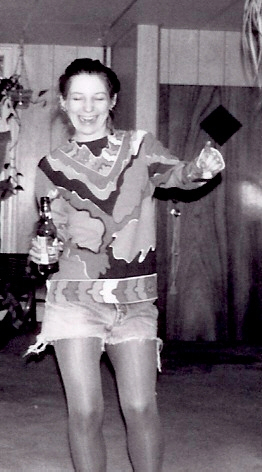 I then proceeded to dye everything in the house indigo. 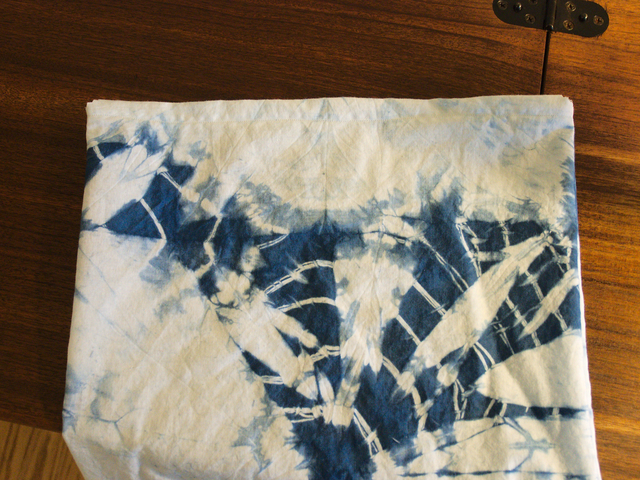 I dyed a white blanket, because neither Mark nor I should be trusted with anything white, and I dyed several garments I had that I didn’t love the colors of (I loved the results of this and am so glad to have several “new” pieces of clothing that I’ll wear much more often now). 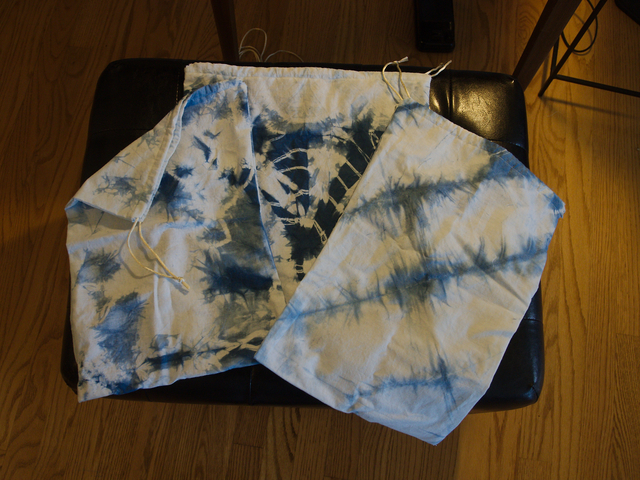 And then I decided to experiment with shibori, which is basically Japanese tie-dyeing. 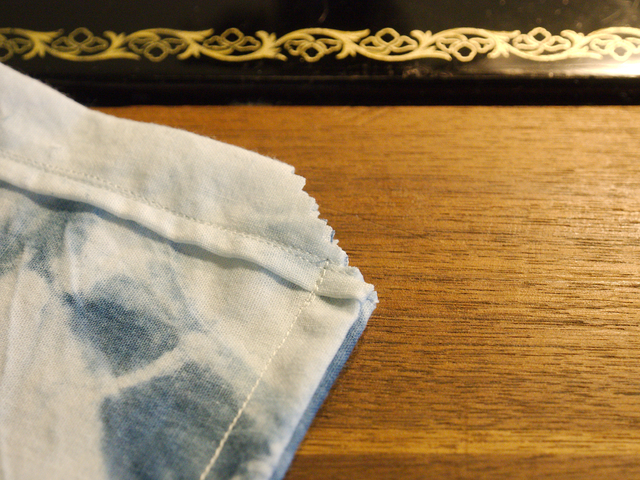 I practiced on strips of muslin. Muslin is a light, inexpensive cotton often used by seamstresses to make mock-ups of sewn items. I tend to keep several yards of muslin on hand because it’s cheap, useful, and I do often make mockups (also referred to as muslins) when I’m drafting patterns for projects. 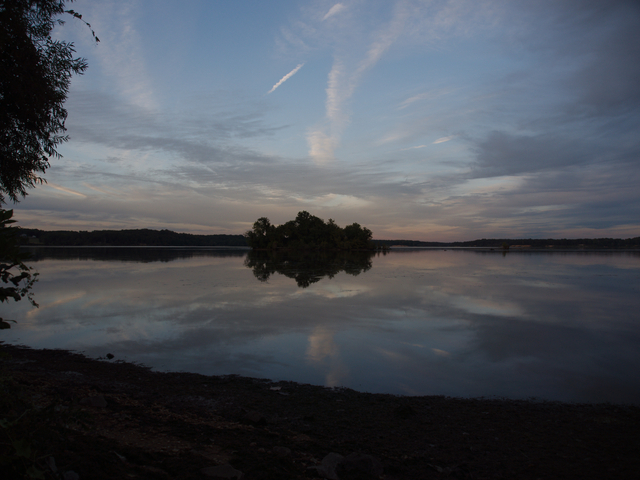 (This makes me sound like I’m a “real” sewer…believe me, I’m not!) Anyway, these qualities made muslin the perfect fabric for me to do some practice shibori on, however, this left me with a bunch of shiboried (I’m not sure that is actually a word, but it is now) pieces of muslin with which I needed to find something to do. 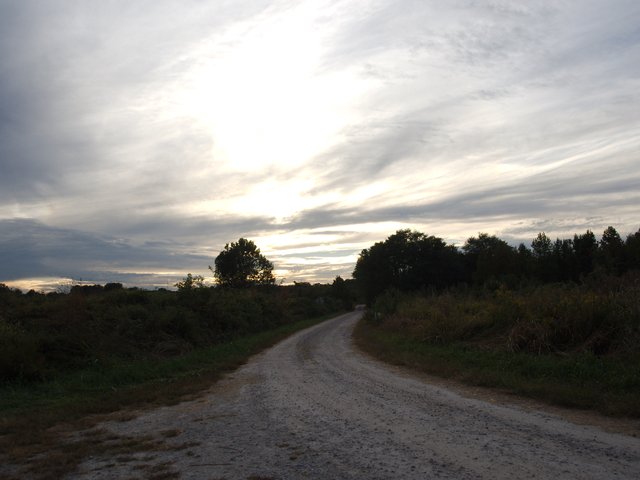 And it just so happened that I’d been meaning to make some drawstring bags to take to the farmers market for things like green beans and potatoes. 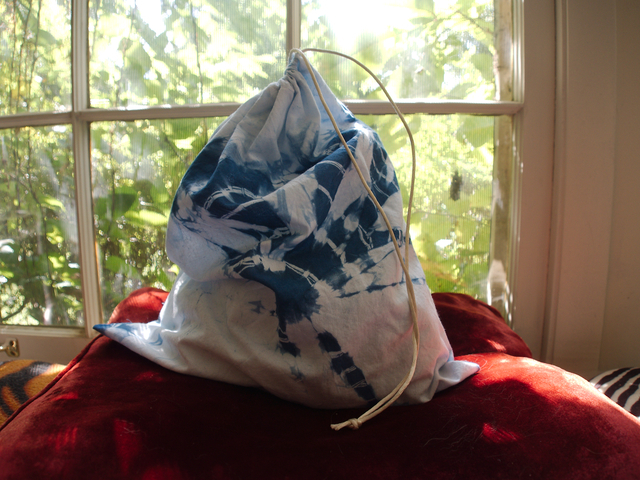 Sooooo, while you certainly do not need to shibori your fabric to make these bags, it explains why mine are tie-dyed, and also shibori is really fun. 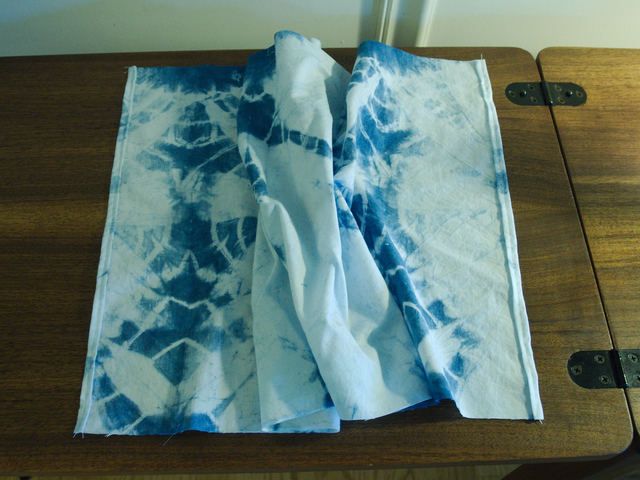 The pre-reduced indigo kit I bought was a good value because I was able to dye quite a few garments, that blanket, a bunch of Smark towels, and a couple yards of muslin for these bags, and I really enjoyed doing all of it. You don’t have to use muslin; any lightweight fabric will do, although if you are a novice sewer (like me), I strongly suggest you stick to 100% cotton with no stretch. Muslin is cheap, strong, and useful to have on hand. I weighed one of my bags and it was exactly one ounce, which I don’t expect to have much if any impact on the price I’m paying for my produce and bulk bin items. 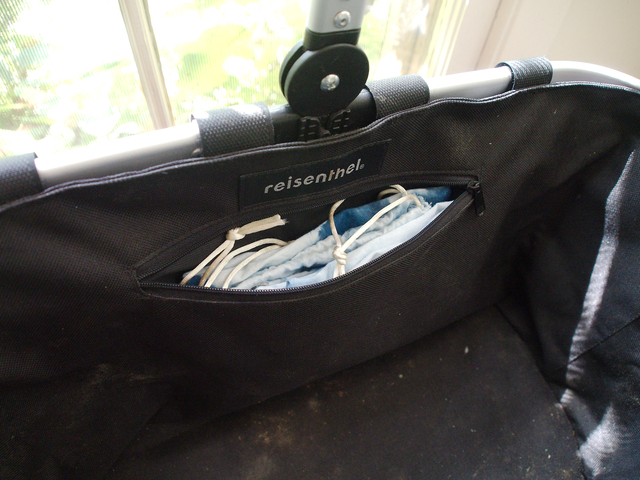 I made my bag by taking one long strip of fabric and folding it half so I only had to sew up the left and the right side; the bottom was the fold. 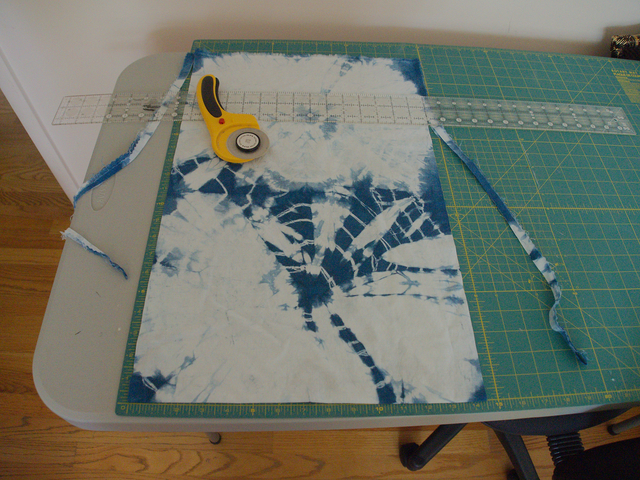 The best way for you to cut your fabric may be to cut two pieces. You can make it whatever size you want, but when cutting, add 1″ to the width and 3″ to the length you want your final product. Here I’ve laid out my folded fabric on my rotary mat, which I also used to measure it. 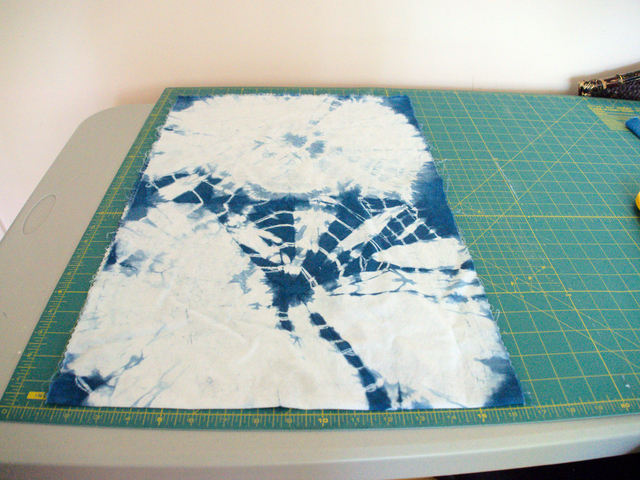 I cut my fabric so it was 14.5″ wide and 16″ high (but remember, it’s folded, so really I have one piece of fabric that’s 14.5″ x 32″; if you are cutting two pieces instead of one long strip, cut them both the same size). 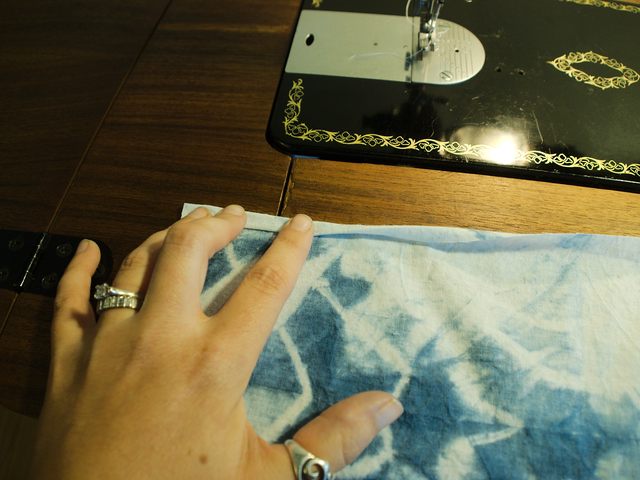 You can use regular fabric scissors if you don’t have a rotary cutter and mat. First we are going to make the casing for the drawstring. 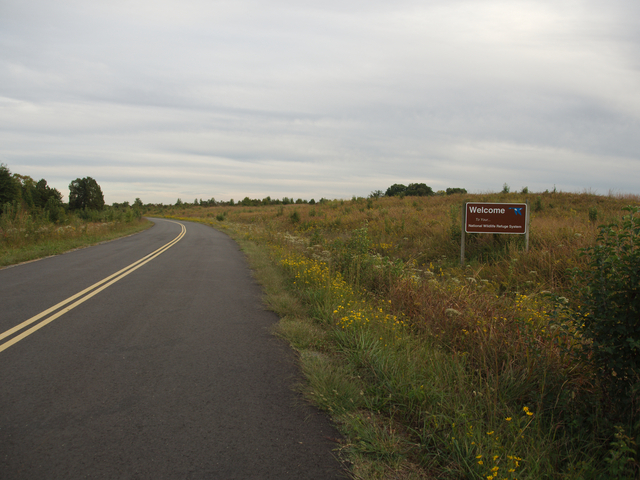 There are two ways to do this: what is probably the better way, and what is the lazy way. The better way involves pressing so I did it the lazy way. 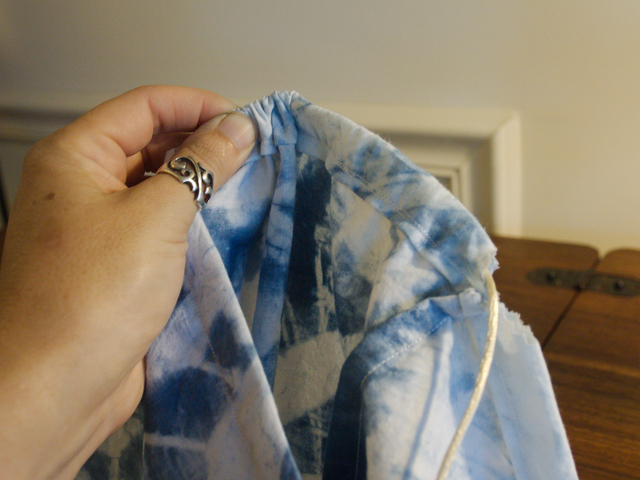 Place the fabric right side down (if your fabric has a front side; muslin doesn’t really) in front of you. You want to fold the top edge over by about 1/8″, then over again by another 1/8″, so the raw edge is hidden. The best thing to do here would probably be to just press this, but I pin and stitch it. 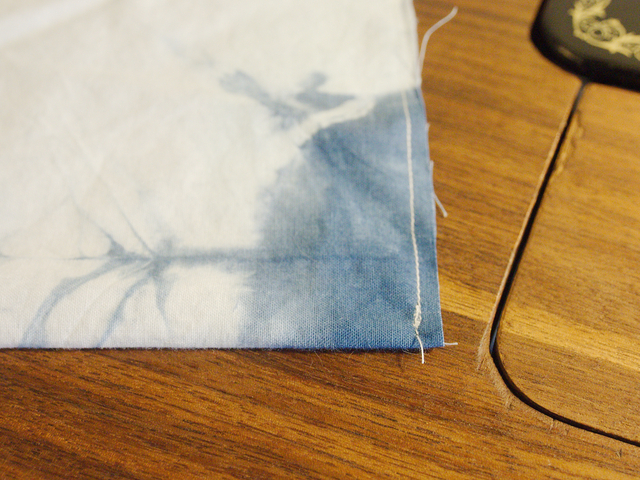 Pressing is better because it uses less thread and you only end up stitching once. Stitching is easier because I much prefer sewing to pressing. 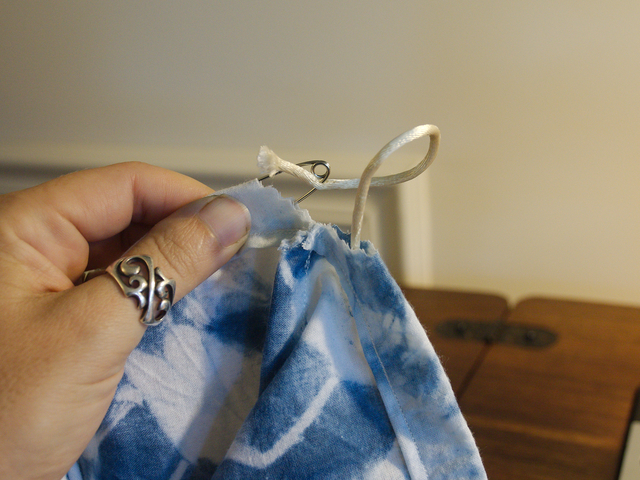 If you have two pieces of fabric, repeat on the top edge of the second piece. If you have on long strip like me, repeat on the “other” top edge, making sure that you fold down on the same side of fabric. The next step is to actually make the casing. All you have to do is fold the folded edge down one more time. How wide you make the casing depends on the cord you’ll be using, but 3/4″, as I’ve done here, should be more than large enough. Just make sure you’ll be able to get your large safety pin through it later. Pin. Stitch the casing closed. 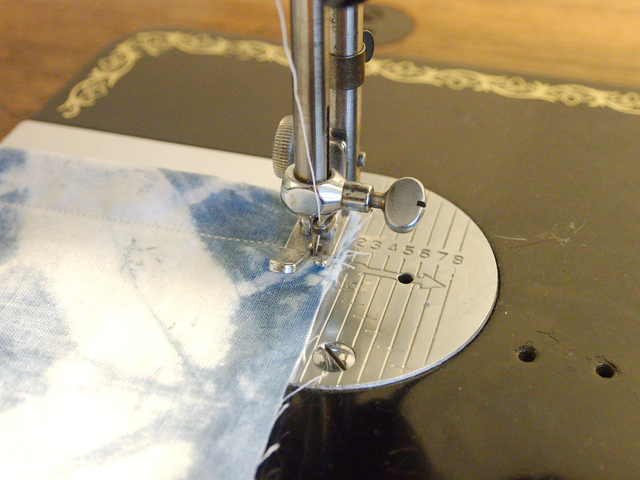 If you stitched for the first step instead of pressing, stitch right over your first line of stitching. 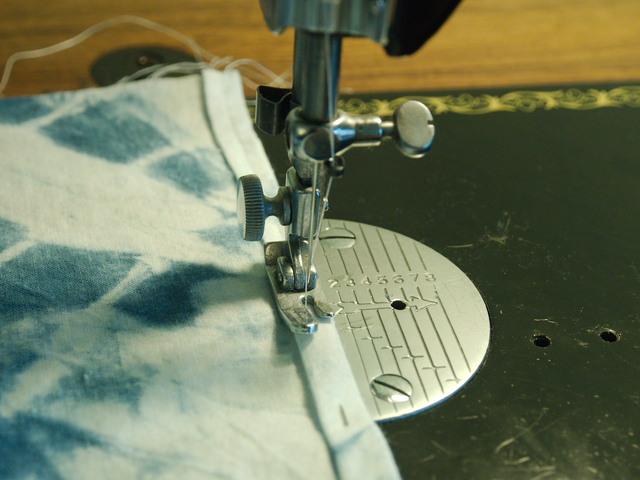 If you pressed for the first step, stitch near the bottom of the casing. 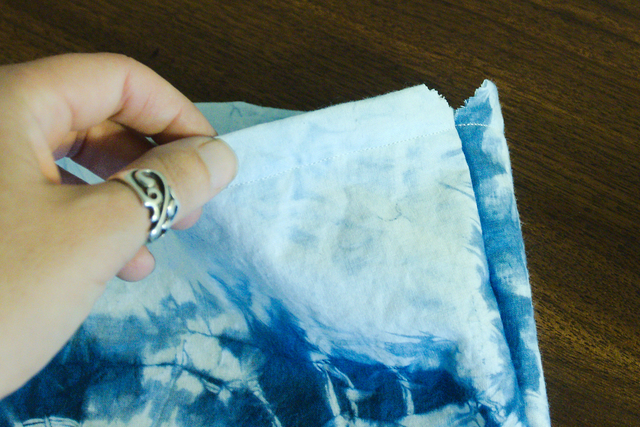 Repeat this step for the other piece or other side of fabric. Next we’ll sew the bag closed. We’re going to use french seams to do this, so although normally you would always sew seams with right sides of the fabric together, we are going to start by sewing the seams wrong sides together. Even if your fabric didn’t have a right and a wrong side to begin with, now that you’ve made the casing it does. The wrong side of the fabric is the side the casing is folded into. If you have two pieces of fabric, put one right side down and then place the other on top of it, right side up, lining the casings up at the top. 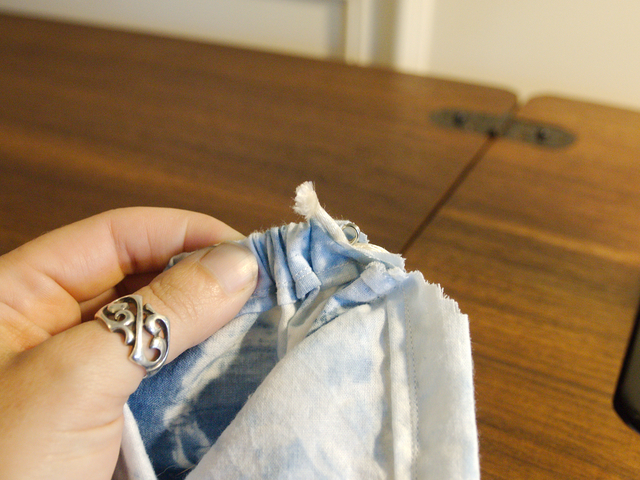 If you have one piece of fabric, fold it so the casings are at the top and the right sides are facing out. 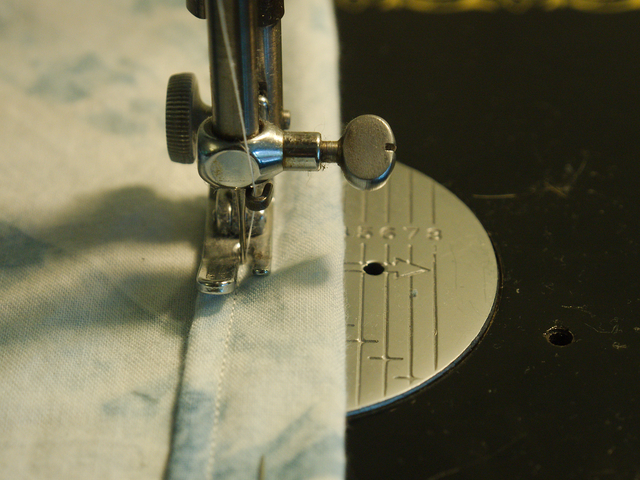 Starting at the stitching of the casing, NOT the top of the fabric, sew the right side using a 1/8″ seam. For me, the right of my presser foot is 1/8″. 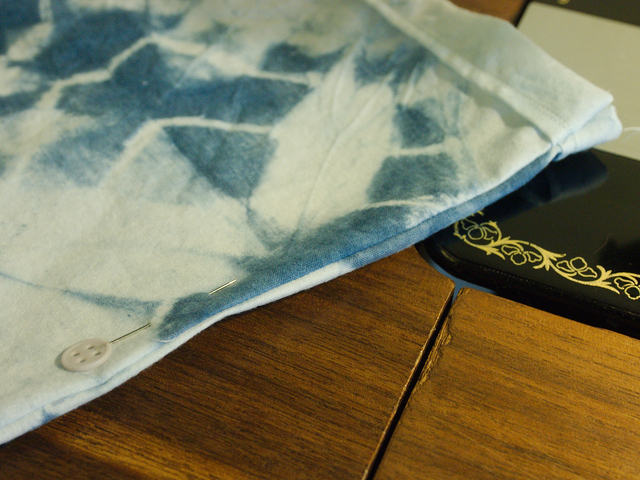 Note in the picture that I’m starting at the bottom of the casing – if you start above the line of stitching you did, you’ll sew the casing shut. If you are using one piece of fabric, sew to the bottom fold, then flip the bag over sew the other side up in exactly the same manner. 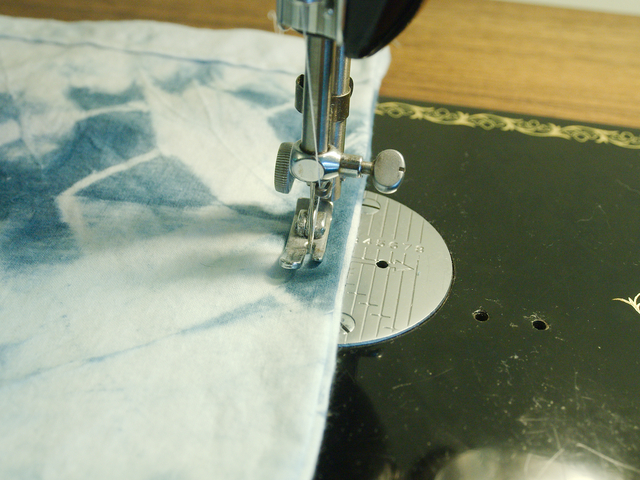 If you have two pieces of fabric, pivot 1/8″ from the the bottom fold and then continue sewing your seam along the bottom, then pivot and sew up the third side, stopping at the bottom of the casing. Again, note that you need to leave the casing open on both sides. Now for the magic of the french seam. Turn the bag inside out. 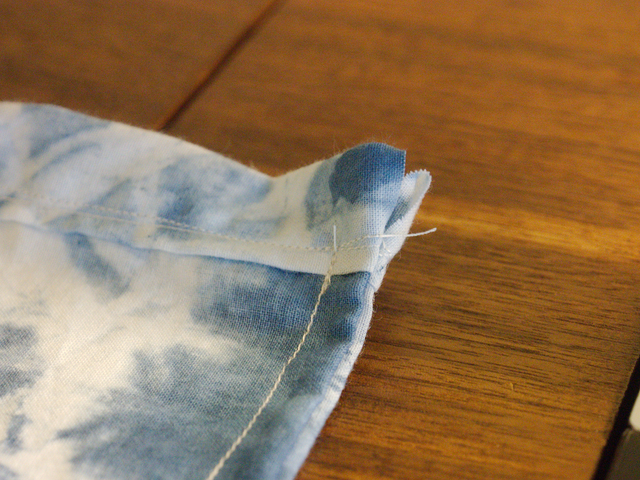 We’re going to sew the side seams again, trapping the raw edges inside. I didn’t bother pinning the inside seams because bags like these are manageable sizes and cotton fabric isn’t going to slip around, but I do pin for the second pass just to sandwich everything together tightly. 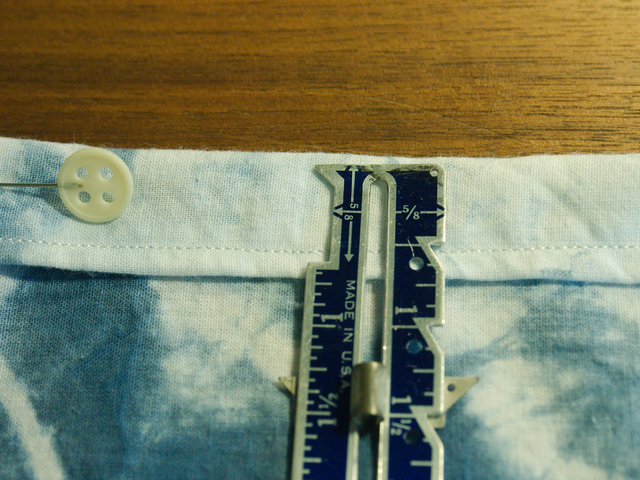 The better way would probably be to press the seams, which would eliminate the need to pin. 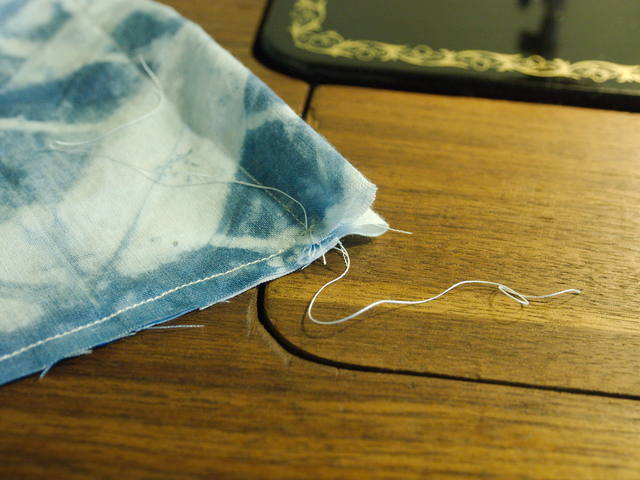 Again, starting at the bottom of the casing, stitch the side seams again, this time 3/8″ from the edge. See the “v” in the casing we have at the seams? … then start feeding it through the casing starting at one of the “v”s. Keep pushing the cord through by pushing the pin through the casing. When you come to the opening on the other side, stick the safety pin in and feed it through the second side of casing. When you are finished, the cords will meet. 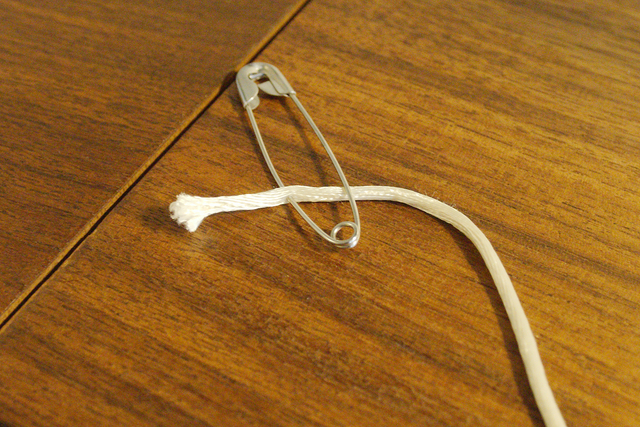 Remove the safety pin and knot the cord ends together. Filled with goodies. These will be great for produce, both at the store and the farmers market, and for bulk bin buys. For the farmers market, I love, love, love this basket, and it has a perfect pocket for stashing these produce bags. 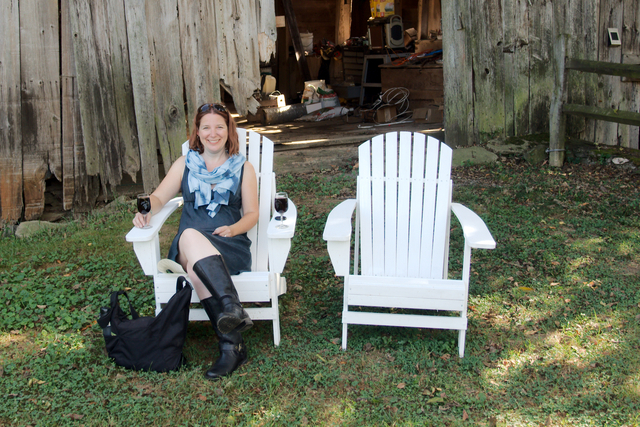 Speaking of shibori, here I am at a local vineyard today (that sells boxed wine, yay!!! 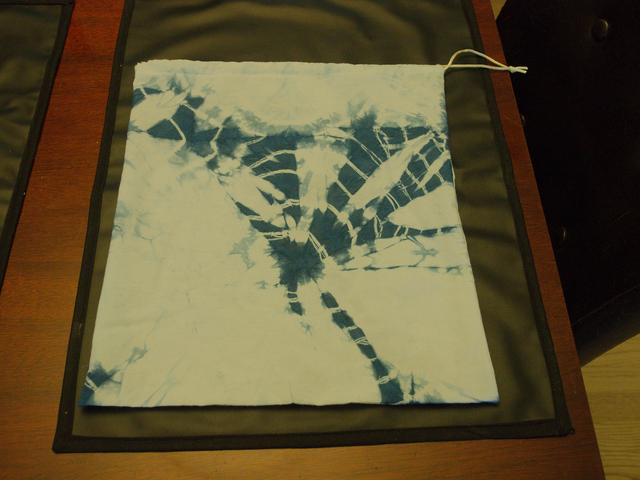 ), sporting a shibori scarf I made. The scarf itself was no-sew because it’s knit and doesn’t ravel; it’s just a long length of a gauzy cotton knit that I shiboried in my indigo vat. And guess what? 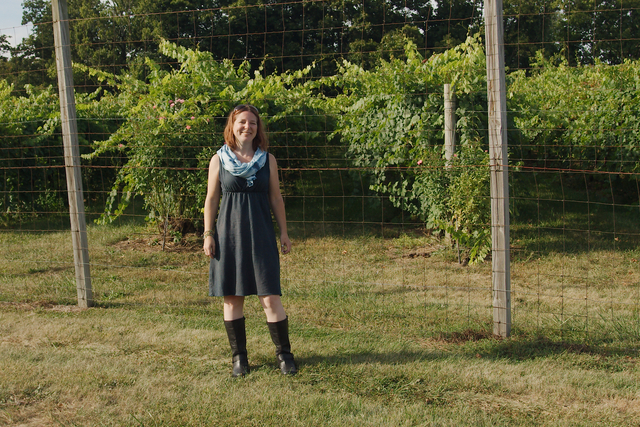 The dress is one of the garments I dyed indigo. 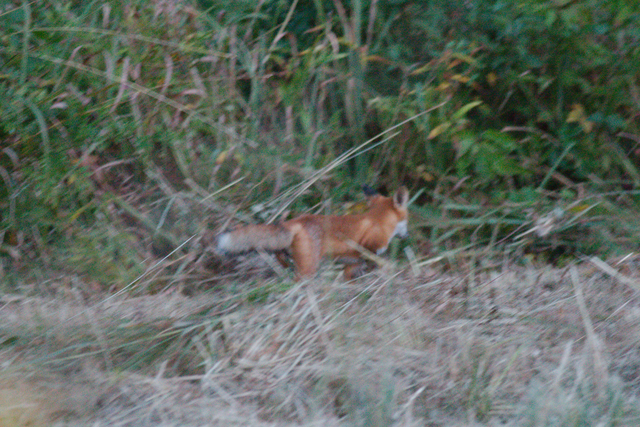 It was previously bright red, if you can believe that. It was pretty, and I wore it red a few times, but usually I’d put it on and take it back off again because it was so bright and I just don’t do bright colors. I LOVE it in its new color. So with no further ado, meet Heidi! 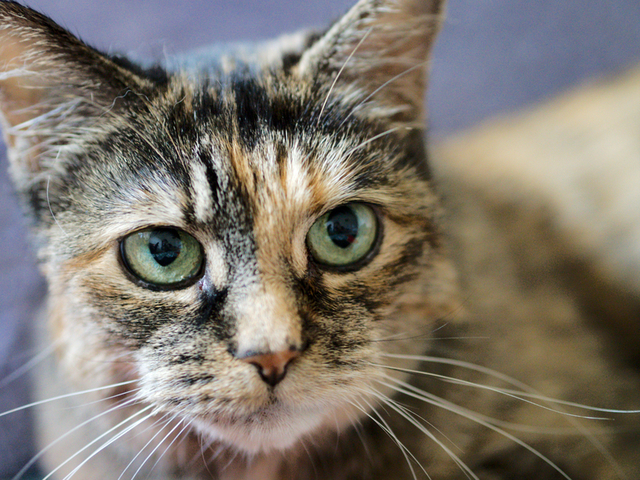 Yep, she’s a tortie like Torticia! The tortie twins don’t like each other much though. Gomez and Torticia have been AWESOME the entire time. They never expressed any concern when I was harboring her in her own room, even though they knew there was another cat in there, and when I started letting her out, Gomez in particular has just wanted to be friends with her. Heidi’s not having it, though. I think she’s just still really terrified of them so she gets all defensive and hisses at them, then Torticia hisses back. Mezzie just walks right up to Heidi and stares at her with his ginormous eyes, head cocked quizzically, like, “why don’t you want to be my friend???? ?” while she’s hissing in his face. 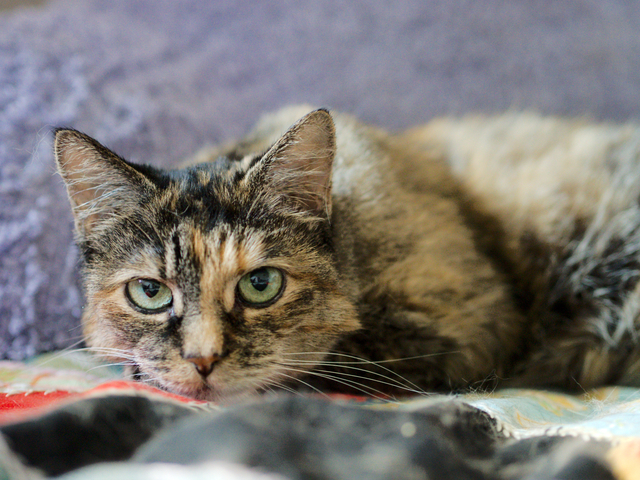 I’m hoping all the hissing calms down eventually, but if months go by and I think Heidi is living in fear, I will try to find a one-cat home for her. She’s very sweet and affectionate when she’s on her own, although Mezzie and Tish are always wherever I am so it’s hard to spend alone time with Heidi. We’re trying to make it work, though, because she IS very sweet, and she does seem super grateful to be here. I was worried she’d cry to go back outside, but she has shown no inclination to return to the great outdoors whatsoever. I really don’t think she was happy out there. I wish I knew who abandoned her. A food post soon, I swear! It’s just that I spent so much of my kitchen time canning over last several weeks that I didn’t have time for blogging, or making blog-worthy meals. 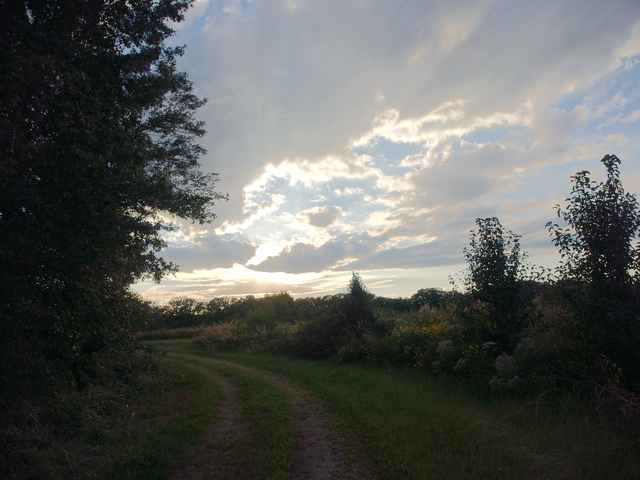 Canning is dwindling down a bit, and half of our raccoons are released, so I’m starting to have more time and I expect to get back into the swing of things soon.